Some people claim that boat trips are the most expensive and uncomfortable way to travel. Boating enthusiasts believe just the opposite. I am a confirmed boating enthusiast. 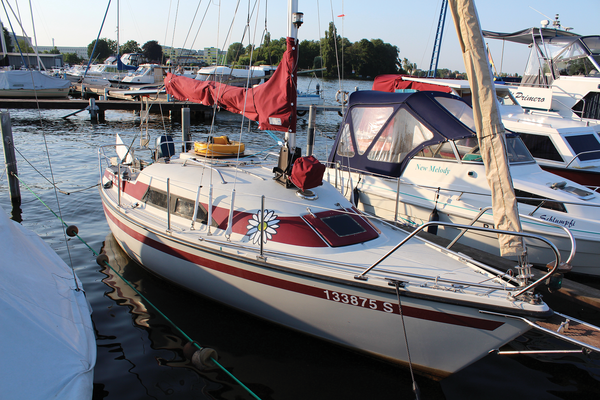 After moving from Vienna to Berlin, I discovered the wonders of the many lakes surrounding the capital city of Germany and made it a priority to purchase a boat. Once I had sufficient money in hand, I settled on the compact and popular Ypton 22 sailing yacht (Figure 1). Figure 1: The author's boat is an Ypton 22, and it now serves as the new home for a Raspberry Pi multimedia player. The previous owner of this boat had tricked it out with assorted gadgets. But now it was in the hands of a confirmed nerd who wanted to implement various ideas for electronic gadgets. After all, it is important to make weekend excursions comfortable, and that comfort requires conveniences such as TV and the ability to play multimedia content. I quickly discovered that the Rasp Pi was ideally suited for the role of bringing multimedia to my boat. There are always two limiting factors on a sport boat, namely space and electrical power. Although my boat – christened the "Coup de Coeur" – has three batteries available, the batteries only deliver 200 Amp under ideal conditions. This is just enough power to run a 1 Amp device for 200 hours. Thus, during boat trips lasting several days, you face the danger of losing electrical power if you don't have access to a land-based electrical connection. As a result, any electronics carried on board need to take up as little space and consume as little power as possible. The Rasp Pi fulfills these two requirements perfectly. The Pi can run satisfactorily with so little power that the ship batteries have enough for many hours of operation. Additionally, OpenELEC offers a handy and fully functioning multimedia center for the mini computer that can play DVB-T and almost any other video format. To use the Raspberry Pi as a DVB receiver, you need some additional hardware. The list of hardware includes at least a compatible DVB dongle and a compatible antenna. Because the Rasp Pi hardware already supports MPEG-2, the Rasp Pi is almost perfect for use as a DVB-T receiver. (See the box called "Rasp Pi and DVB-T2.") However, you will need to get a license key to use MPEG-2. This license costs 10 Euro. You can buy the license directly from Raspberrypi.com for 2.40 British pounds . Unfortunately, the setup described here for DVB-T has an expiration date. Although the DVB-T-stick from PCTV can also handle DVB-T2, this really doesn't matter. It is just transmitting those frequencies to the Rasp Pi that DVB-T2 is supposed to use beginning in Fall 2016. It is up to the receiver that is connected to figure out what to do with this. Here is where the problems start. MPEG2 is used to code DVB-T. Rasp Pi has its own chip set for decoding the videos. (DVB-T2 uses Video-Codec H.265 in Germany.) The mini computer doesn't handle this well because it has to accomplish the decoding on the software side. This, in turn, places too much demand on the CPU even for the Rasp Pi 2. Thus, it becomes clear that the Rasp Pi will no longer be suitable for watching DVB-T TV starting in Fall 2016. But, that won't herald the end of watching TV on my boat. There is already an alternative in the form of the Rasp Pi competitor Odroid C1+ , which implements the codec in hardware. OpenELEC is currently available for the device so the transition can be accomplished easily. It will be interesting to see whether the Raspberry Pi Foundation replaces the MPEG2 chip in the device with an H.265 chip. Then, the Rasp Pi would once again be in the running. Given the limited amount of space on a boat, large video displays like those found in a living room are simply not an option. Moreover, a large display screen would cause the batteries to empty in record time. Although small TVs are available in practically every electronics store, the selection of small TVs that also come with more sophisticated equipment is limited. For example, the TV must have two HDMI ports because I will connect two Rasp Pis. The TV will also need to handle full HD; additionally, it needs to operate with a 12-volt power supply. Not many small TVs fulfill all of these requirements. The 12-volt power supply is a particularly difficult obstacle. I went with a Grundig 22 VLE 5520 BG . This model has all of the necessary functions and is also reasonably priced on Amazon at 220 Euro. With the addition of an adapter cable for 15 Euro, the device can operate directly from the 12-volt power supply of the boat. The adapter does away with the need for an expensive inverter, which would only achieve 90 percent efficiency anyway with a full load. 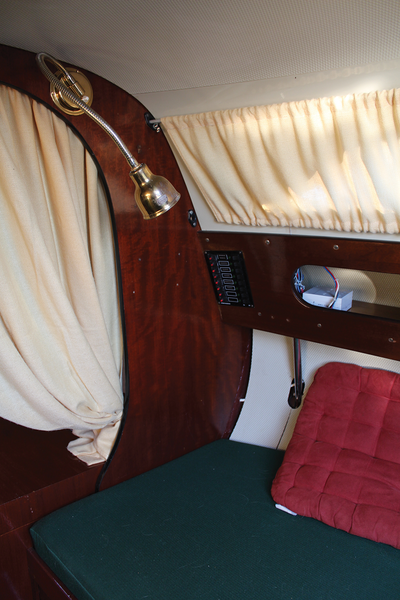 It is a good idea to have a movable TV arm, because inside the small cabin (Figure 2), you might need to turn the TV on its side to do something like use the hatch to get below deck. Figure 2: I placed the multimedia equipment below deck. The illustration provides a view of the Philippi control panel, which is used for controlling the individual 12-volt circuits on board.